Diamine Burgundy Royale 150th Anniversary Fountain Pen Ink is one of 13 special ink colors released by Diamine Ink Company for their 150th Anniversary, celebrated in 2014. These special colors come in very unique triangular shaped bottles that form a circle when 8 bottles are placed together. The 13 colors include Tudor Blue, Silver Fox, Lilac Night, Dark Forest, Golden Honey, Terra Cotta and Burgundy Royale along with a few others. Diamine Burgundy Royale 150th Anniversary Ink is a deep dark burgundy color that shows up very well on paper. This dark burgundy ink has many wonderful characteristics which are discussed below. Milestone anniversaries such as 150 years come along only once a generation, so be sure to pick up a few of these inks before they are gone. Diamine inks are made in the UK and are well regarded for their quality, price, and color. Continuing reading for a chance to win the bottle of Diamine Burgundy Royale Ink we used for this review. We used a French-made glass dip pen from J. Herbin Pen Company along with Rhodia dot pad paper for our review of Diamine Burgundy Royale 150th Anniversary Ink. Your results may be different depending on the paper and pen you use with this ink. One of the most unique traits about Diamine Burgundy Royale Ink along with all Diamine 150th Anniversary inks is the unique shape of the bottle. Each anniversary ink comes in a 40 ml. triangular glass bottle that forms a circle, like a pizza pie, with 8 bottle slices. Diamine 150th Anniversary Burgundy Royale Ink retails in the US for $15.95, but we offer it at a discounted price. 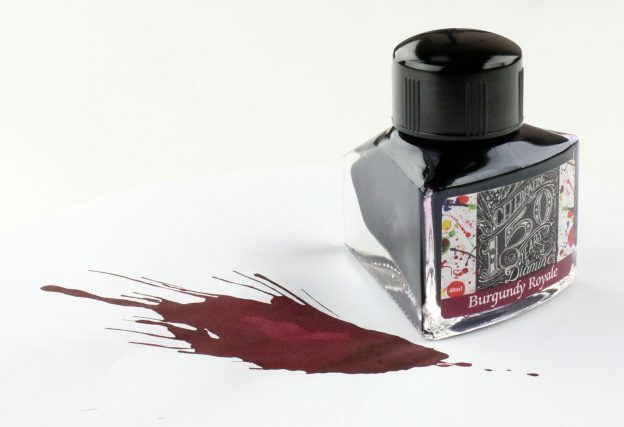 Burgundy Royale is more expensive than standard Diamine ink, but with the special edition bottle and special edition color, it is well worth the price. During our review of Diamine Burgundy Royale Ink we found a dry time of approximately 8-10 seconds. This put the ink at the top of our scale for an everyday use ink. We found no bleeding during our review of Diamine 150th Anniversary Burgundy Royale Ink, both with normal use and the cotton swab test. We experienced no feathering with Diamine Burgundy Royale Ink with normal use. Typical for a non-waterproof ink there was slight feathering during our water test. 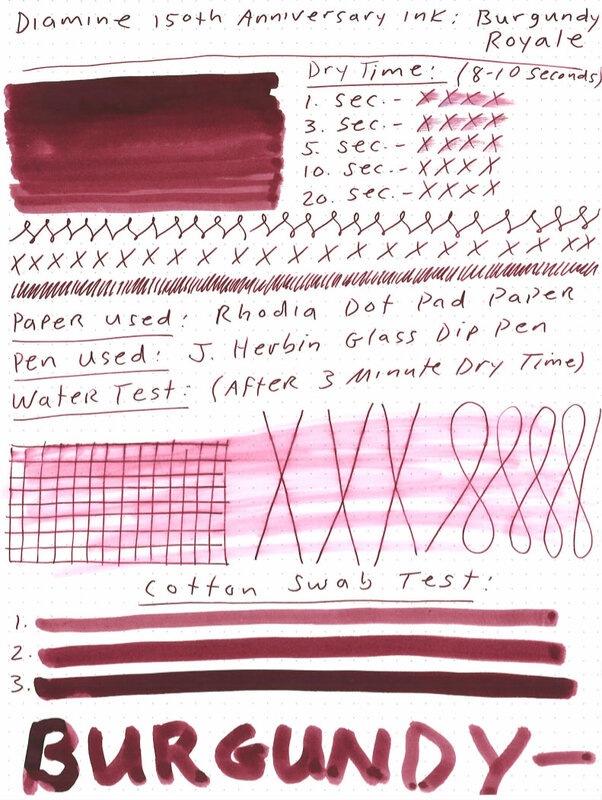 During our review of Diamine Burgundy Royale Ink we ran a wet cotton swab over a dried ink sample. Our results produced significant color smearing not unusual for a non-waterproof dark colored ink, but very little additional feathering. Diamine 150th Anniversary Burgundy Royale Ink shades quite well under the right conditions using the proper writing technique and pen. From deep dark black-burgundy color to light almost pink-burgundy color, there is a possibility for lots of color variation. Diamine has done a great job celebrating the beginning of their ink company in 1864! They have produced great ink colors with an even more interesting and unique bottle. Diamine Burgundy Royale 150th Anniversary Ink is a very nice color, has great shading traits with a fairly quick dry time. The only downside to the triangular shaped bottle is that it makes you want to buy a minimum of 8 colors to complete a circle. Happy Writing from the UK! Would love to see a review on any unusual properties of iron gall inks! Absolutely Smashing colour!! So rich! God Bless & the Love of Christ to you all!! I don’t like bright red ink but this deep burgundy shade looks serious enough to use!!! this is such a classic brown-red color, I love it. I love the dark burgundy inks! Love burgundy inks. Thanks for the opportunity! Oh my gosh! What a gorgeous burgundy! Reminds me of a delicious merlot. I want this in my collection.✒Thank you Pen Chalet for the giveaway. I would love to see more burgundy inks. I would like to see reviews of 3 Oysters inks.